24 March 1995: born in Tôkyô. His mother was a geisha from the district of Akasaka. His father was said to be a businessman from Kyûshû. His brother was the future actor Daitokuji Shin. There was also a rumour/legend about his real father who could have been Onoe Kikugorô VI. May 1921: he made his first appearance on stage, at the Ichimuraza, where he received the name of Onoe Ushinosuke IV and played the role of Kintarô; the role of Kintarô's mother Yamanba was played by Onoe Baikô VI. December 1933: Ushinosuke played at the Misonoza (Nagoya) the role of Ohisa in the drama "Ninjô Banashi Bunshichi Mottoi"; his stage partners were Onoe Kikugorô VI (Ohisa's father Chôbê) and Onoe Taganojô III (Ohisa's mother Okane). 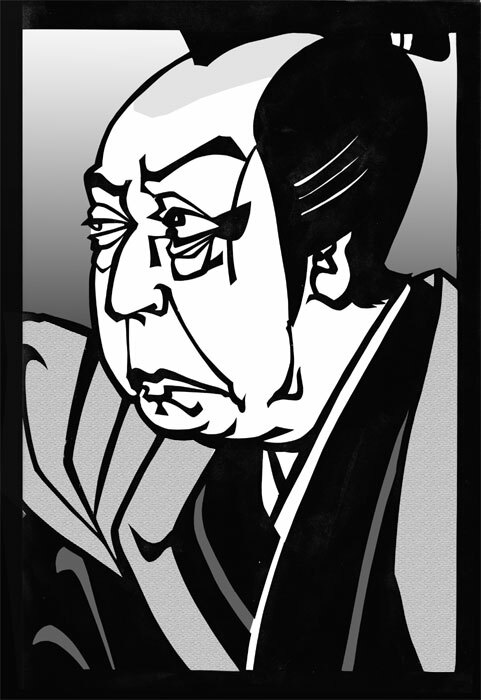 March 1935: Onoe Ushinosuke IV took the name of Onoe Kikunosuke III at the Kabukiza. September 1935: premiere at the Kabukiza of Uno Nobuo's drama "Kôdan Yomiya no Ame"; Kikunosuke played the role of Ryûtatsu's daughter Otora [more details]. He also played the role of Ohisa in the drama "Ninjô Banashi Bunshichi Mottoi"; his stage partners were Onoe Kikugorô VI (Chôbê) and Onoe Taganojô III (Okane). April 1936: revival at the Kabukiza of the drama "Uwanari", which belonged to the Kabuki Jûhachiban; Kikunosuke played the role of Princess Shiragiku [more details]. January 1938: Kikunosuke played at the Kabukiza the role of Yasuke in the "Sushiya" scene of the drama "Yoshitsune Senbon Zakura". He also plays Kasane in the dance-drama "Iro Moyô Chotto Karimame". March 1938: Kikunosuke played at the Kabukiza the role of the princess Yaegaki in the scène "Jusshukô" scene of the play "Honchô Nijûshikô". September 1938: Kikunosuke played for the first time the role of the Wisteria Maiden (Fuji Musume) in the dance "Ôtsue", which was performed at the Minamiza (Kyôto). April 1942: Kikunosuke played at the Kabukiza the role of Ohisa in the drama "Ninjô Banashi Bunshichi Mottoi"; his stage partners were Onoe Kikugorô VI (Chôbê) and Onoe Taganojô III (Okane). February 1944: Kikunosuke played at the Kabukiza the role of the courtesan Azuma in the "Sumôba" scene of the play "Futatsu Chôchô Kuruwa Nikki"; his stage partners were Onoe Kikugorô VI (Nuregami Chôgorô) and Ichimura Uzaemon XV (Hanaregoma Chôkichi, Yamazaki Yogorô). October 1944: Kikunosuke played at the Shinbashi Enbujô the role of Ohisa in the drama "Ninjô Banashi Bunshichi Mottoi"; his stage partners were Onoe Kikugorô VI (Chôbê) and Onoe Taganojô III (Okane). January 1946: Kikunosuke played for the first time the role of the courtesan Michitose in the drama "Yuki no Yûbe Iriya no Azemichi", which was staged at the Tôkyô Gekijô; the role of Michitose's lover Kataoka Naojirô was played by Onoe Kikugorô VI. February 1947: great shûmei at the Tôkyô Gekijô; Onoe Kikunosuke III took the name of Onoe Baikô VII by playing the roles of Soga Jûrô and Okaru in the drama "Kotobuki Soga no Taimen" and the dance "Ochiudo". September 1947: premiere at the Imperial Theater of Atsumi Seitarô's version of "Nansô Satomi Hakkenden"; Baikô played the roles of Inusaka Keno, Hamaji and Hikite [casting]. June 1948: Baikô played at the Tôkyô Gekijô the roles of Kojirô and Atsumori in the "Jinmon" and "Kumiuchi" scenes of the classic "Ichi-no-Tani Futaba Gunki"; the roles of the warrior Kumagai Jirô Naozane and Princess Tamaori were played by Nakamura Kichiemon I and Nakamura Shikan VI. February 1949: Baikô played the role of Okaru in the "Gion Ichiriki Jaya" act of the classic "Kanadehon Chûshingura", which was staged at the Tôkyô Gekijô; the role of Yuranosuke was played by Onoe Kikugorô VI. January 1951: Baikô played at the Meijiza the role of the shirabyôshi Hanako in the dance "Kyôganoko Musume Dôjôji"; the role of the demon-queller was played by Bandô Hikosaburô VII. February 1951: Baikô played at the Misonoza (Nagoya) the role of the shirabyôshi Hanako in the dance "Kyôganoko Musume Dôjôji"; the role of the demon-queller was played by Bandô Hikosaburô VII. July 1951: revival at the Shinbashi Enbujô of Kawatake Mokuami's drama "Jitsugetsusei Kyôwa Seidan"; Baikô played the role of Rokubê's daughter (and Kumemura's meshitsukai) Okoro [casting]. August 1951: Baikô played at the Kabukiza the roles of Kojirô and Atsumori in the "Jinmon" and "Kumiuchi" scenes of the classic "Ichi-no-Tani Futaba Gunki"; the role of the warrior Kumagai Jirô Naozane was played by Matsumoto Kôshirô VIII. December 1951: Baikô played for the first time, at the Meijiza, the role of Tamate Gozen in the drama "Sesshû Gappô-ga-Tsuji"; the roles of Gappô and Shuntokumaru were played by Ichikawa Omezô IV and Nakamura Fukusuke VII. January 1952: premiere at the Shinbashi Enbujô of Hagiwara Yukio's Kiyomoto-based dôjôjimono "Yuki no Dôjôji"; Baikô played the role of the ghost of Princess Kiyo [casting]. April 1952: Baikô played at the Ôsaka Kabukiza the role of Benten Kozô in the full length production of Kawatake Shinshichi II's drama "Benten Musume Meo no Shiranami". October 1952: premiere at the Kabukiza of Osaragi Jirô's drama "Wakaki Hi no Nobunaga"; Baikô played the role of Yayoi [casting]. He also played the role of the shirabyôshi Hanako in the dance "Kyôganoko Musume Dôjôji". November 1952: Baikô played at the Ôsaka Kabukiza the role of the shirabyôshi Hanako in the dance "Kyôganoko Musume Dôjôji"; the role of the demon-queller was played by Bandô Hikosaburô VII. March 1953: premiere at the Kabukiza of Osaragi Jirô's drama "Edo no Yûbae"; Baikô played the role of the geisha Oriki [casting]. January 1954: the duet Onoe Baikô - Ichikawa Ebizô played for the first time in the drama "Yuki no Yûbe Iriya no Azemichi", which was staged at the Shinbashi Enbujô. Ichikawa Ebizô IX played the role of Kataoka Naojirô and Baikô the role of the courtesan Michitose. October 1954: Baikô played at the Kabukiza the role of the shirabyôshi Hanako in the dance "Kyôganoko Musume Dôjôji". November 1954: Baikô played at the Ôsaka Kabukiza the role of the shirabyôshi Hanako in the dance "Kyôganoko Musume Dôjôji". December 1954: premiere at the Meijiza of Kawaguchi Matsutarô's revision of Chikamatsu Monzaemon's drama "Daikyôji Mukashi Goyomi", which was entitled "Osan Mohei"; Baikô played the role of Osan [casting]. June 1955: Baikô played at the Kabukiza the role of the shirabyôshi Hanako in the dance "Kyôganoko Musume Dôjôji". October 1956: Baikô played at the Kabukiza the role of the shirabyôshi Hanako in the dance "Kyôganoko Musume Dôjôji". March 1957: Baikô played at the Kabukiza the roles of Kojirô and Atsumori in the "Jinmon" and "Kumiuchi" scenes of the classic "Ichi-no-Tani Futaba Gunki"; the role of the warrior Kumagai Jirô Naozane was played by Onoe Shôroku II. January 1958: Baikô played at the Shinbashi Enbujô the role of Tamate Gozen in the drama "Sesshû Gappô-ga-Tsuji"; the roles of Gappô and Shuntokumaru were played by Ichikawa Sadanji III and Nakamura Fukusuke VII. March 1958: Baikô played at the Kabukiza the role of Abe no Yasuna in the dance "Kosode Monogurui". April 1958: Baikô played at the Misonoza (Nagoya) the role of Tamate Gozen in the drama "Sesshû Gappô-ga-Tsuji"; the roles of Gappô and Shuntokumaru were played by Ichikawa Sadanji III and Nakamura Fukusuke VII. October 1958: Baikô played at the Kabukiza the role of the shirabyôshi Hanako in the dance "Kyôganoko Musume Dôjôji". June 1959: Baikô played at the Kabukiza the role of Benten Kozô in the "Hamamatsuya" and "Inasegawa" scenes of Kawatake Shinshichi II's drama "Benten Musume Meo no Shiranami". November 1959: Baikô played at the Ôsaka Shinkabukiza the role of the shirabyôshi Hanako in the dance "Kyôganoko Musume Dôjôji"; the role of the demon-queller was played by Onoe Kurôemon II. He also played the role of Benten Kozô in the "Hamamatsuya" and "Inasegawa" scenes of Kawatake Shinshichi II's drama "Benten Musume Meo no Shiranami". January 1960: Baikô played at the Shinbashi Enbujô the role of the shirabyôshi Hanako in the dance "Kyôganoko Musume Dôjôji"; the role of the demon-queller was played by Ichimura Uzaemon XVII. September 1961: Baikô played at the Kabukiza the role of Ohatsu in the drama "Kagamiyama Kokyô no Nishikie"; the roles of Onoe and Iwafuji were performed by Nakamura Utaemon VI and Ichikawa Ebizô IX. October 1961: Baikô played at the Ôsaka Shinkabukiza the role of the shirabyôshi Hanako in the dance "Kyôganoko Musume Dôjôji". June 1962: revival at the Kabukiza under the supervision of Takechi Tetsuji of Namiki Gohei I's drama "Keisei Yamato Zôshi"; Baikô played the roles of Gunjibei's son Sukekuni and Kitabatake Yukienosuke [more details]. January 1963: Baikô played at the Shinbashi Enbujô the role of the shirabyôshi Hanako in the dance "Kyôganoko Musume Dôjôji". November 1963: Baikô played at the Kabukiza the role of the shirabyôshi Hanako in the dance "Kyôganoko Musume Dôjôji"; the role of the demon-queller was played by Bandô Mitsugorô VIII. February 1964: Baikô played at the Kabukiza the role of Benten Kozô in the full length production of Kawatake Shinshichi II's drama "Benten Musume Meo no Shiranami". December 1964: Baikô played at the Minamiza the role of the shirabyôshi Hanako in the dance "Kyôganoko Musume Dôjôji". October 1965: Baikô took part in the first Kabuki tour in Western Europe; he played the roles of Sakuramaru, the dancer Hanako and En'ya Hangan in the plays "Kurumabiki", "Musume Dôjôji" and "Kanadehon Chûshingura" [casting]. January 1966: Baikô played at the Kabukiza the role of Shigenoi in the "Shigenoi Kowakare" scene of the drama "Koi Nyôbô Somewake Tazuna". He also played the role of the shirabyôshi Hanako in the dance "Kyôganoko Musume Dôjôji". November 1966: opening ceremony of the National Theatre in Tôkyô with the full length performance of the classic "Sugawara Denju Tenarai Kagami" in which Baikô played the roles of Tonami and Sakuramaru [casting]. December 1966: second month of the opening ceremony of the National Theater with the full length performance of the classic "Sugawara Denju Tenarai Kagami" in which Baikô played the roles of Sakuramaru and Chiyo [casting]. February 1967: premiere at the Kabukiza of Hagiwara Yukio's dance-drama "Dattan"; Baikô played the role of the woman of the blue cloth [casting]. March 1967: tour in Hawai; Baikô played the role of Princess Taema in the drama "Narukami". December 1967: Baikô played at the Minamiza the role of the shirabyôshi Hanako in the dance "Kyôganoko Musume Dôjôji". February 1968: Baikô played at the Kabukiza the role of the shirabyôshi Hanako in the dance "Kyôganoko Musume Dôjôji". March 1968: Baikô received the prestigious title of Living National Treasure (ningen kokuhô). June 1968: Baikô played at the National Theatre the role of Tamate Gozen in the drama "Sesshû Gappô-ga-Tsuji"; the roles of Gappô and Shuntokumaru were played by Bandô Mitsugorô VIII and Nakamura Shikan VII. May 1969: Baikô played at the Ôsaka Shinkabukiza the role of the shirabyôshi Hanako in the dance "Kyôganoko Musume Dôjôji". October 1970: Baikô played at the National Theatre the role of Tamate Gozen in the drama "Sesshû Gappô-ga-Tsuji"; the roles of Gappô and Shuntokumaru were played by Bandô Mitsugorô VIII and Onoe Tatsunosuke I. March 1971: Baikô played at the National Theatre the role of the shirabyôshi Hanako in the dance "Kyôganoko Musume Dôjôji"; the role of the demon-queller was played by Ichimura Uzaemon XVII. April 1971: revival at the National Theatre of Nagawa Shimesuke I's drama "Sumidagawa Gonichi no Omokage"; Baikô played the role of Jinzaburô's wife Oshizu [casting]. October 1971: Baikô played at the Misonoza (Nagoya) the role of the shirabyôshi Hanako in the dance "Kyôganoko Musume Dôjôji"; the role of the demon-queller was played by Onoe Shôroku II. He also played the role of Benten Kozô in the "Hamamatsuya" and "Inasegawa" scenes of Kawatake Shinshichi II's drama "Benten Musume Meo no Shiranami". November 1971: Baikô played for the last time the role of Benten Kozô, at the Kabukiza, in the "Hamamatsuya" and "Inasegawa" scenes of Kawatake Shinshichi II's drama "Benten Musume Meo no Shiranami". February 1972: Baikô played at the Kabukiza the role of Tamate Gozen in the drama "Sesshû Gappô-ga-Tsuji"; the roles of Gappô and Shuntokumaru were played by Ichimura Uzaemon XVII and Nakamura Shikan VII. April 1972: Baikô played at the National Theatre the roles of Kojirô and Atsumori in the "Jinmon" and "Kumiuchi" scenes of the classic "Ichi-no-Tani Futaba Gunki"; the role of the warrior Kumagai Jirô Naozane was played by Matsumoto Kôshirô VIII. June 1973: revival at the National Theatre of Tsuruya Nanboku IV and Sakurada Jisuke II drama "Kokoro no Nazo Toketa Iroito"; Baikô played the roles of the courtesan Koito and Otoki [casting]. November 1973: Baikô played at the Kabukiza the roles of Kojirô and Atsumori in the "Jinmon" and "Kumiuchi" scenes of the classic "Ichi-no-Tani Futaba Gunki"; the role of the warrior Kumagai Jirô Naozane was played by Matsumoto Kôshirô VIII. March 1974: Baikô played at the National Theatre the role of Tamate Gozen in the drama "Sesshû Gappô-ga-Tsuji"; the roles of Gappô and Shuntokumaru were played by Ichimura Uzaemon XVII and Ichikawa Somegorô VI. September 1974: Baikô played at the National Theatre the role of the courtesan Miyokichi in Kawatake Shinshichi II's drama "Hachiman Matsuri Yomiya no Nigiwai"; the role of Chijimiya Shinsuke was played by Nakamura Kanzaburô XVII. January 1975: Baikô played at the National Theatre the role of Umekichi's wife Osuga in Kawatake Mokuami's drama "Mekura Nagaya Ume-ga-Kagatobi"; the role of Umekichi was played by Onoe Shôroku II. Baikô also performed the dance "Fumiuri". March 1975: revival at the National Theatre of Kawatake Shinshichi II's drama "Jiraiya Gôketsu Monogatari"; Baikô played the role of Takasago Yûminosuke [casting]. December 1975: Baikô played at the National Theatre the role of En'ya Hangan in the 1st, 3rd and 4th acts of the classic "Kanadehon Chûshingura"; the roles of Yuranosuke and Moronô were played by Nakamura Kanzaburô XVII and Ichimura Uzaemon XVII. January 1976: Baikô played at the National Theatre the roles of Yoshitsune and the courtesan Miuraya no Agemaki in the dramas "Kanjinchô" and "Kurotegumi Kuruwa no Tatehiki"; the role of Sukeroku was played by his son Onoe Kikugorô VII. February 1976: Baikô played at the Kabukiza the role of the shirabyôshi Hanako in the dance "Kyôganoko Musume Dôjôji"; the role of the demon-queller was played by Ichimura Uzaemon XVII. April 1976: Baikô played at the Kabukiza the role of Ohatsu in the drama "Kagamiyama Kokyô no Nishikie"; the roles of Onoe and Iwafuji were performed by Nakamura Utaemon VI and Nakamura Kanzaburô XVII. October 1976: Baikô played at the National Theatre the roles of Tokaiya Ginpei's wife Oryû and Suke-no-Tsubone in the "Tokaiya" and "Daimotsu no Ura" scenes of the classic "Yoshitsune Senbon Zakura"; the role of Tokaiya Ginpei/Tomomori was played by Onoe Shôroku II. November 1976: Baikô played at the National Theatre the roles of Yasuke, Koremori and Shizuka Gozen in the "Sushiya" and "Shi-no-Kiri" scenes of the classic "Yoshitsune Senbon Zakura". December 1976: Baikô played at the Minamiza the role of the shirabyôshi Hanako in the dance "Kyôganoko Musume Dôjôji". January 1977: Baikô played at the National Theatre the role of the courtesan Miuraya no Agemaki in the drama "Sukeroku Kuruwa no Momoyogusa"; the role of Sukeroku was played by Onoe Shôroku II. Baikô also performed in the dance "Asazuma Bune". March 1977: Baikô played at the National Theatre the roles of Princess Shiranui, Suzushiro and Akishino in the drama "Shiranui Monogatari". October 1977: Baikô played at the Misonoza (Nagoya) the role of Tamate Gozen in the drama "Sesshû Gappô-ga-Tsuji"; the roles of Gappô and Shuntokumaru were played by Ichimura Uzaemon XVII and Onoe Kikugorô VII. December 1977: Baikô played at the National Theatre the role of the courtesan Yayoi in the dance "Makura Jishi". January 1978: Baikô played at the National Theatre the role of the courtesan Sumizome (in fact the spirit of Komachi's cherry tree) in the dance-drama "Tsumoru Koi Yuki no Seki no To"; his stage partners were all Otowaya guild's members: Onoe Shôroku II (Sekibê/Kuronushi), Onoe Kikugorô VII (Ono no Komachi) and Onoe Tatsunosuke I (Yoshimine Munesada). March 1978: Baikô played at the National Theatre the roles of Iwahashi, Okuni and Oume in Tsuruya Nanboku IV's drama "Ukiyozuka Hiyoku no Inazuma". November 1978: Baikô played at the Kabukiza the role of Tamate Gozen in the drama "Sesshû Gappô-ga-Tsuji"; the roles of Gappô and Shuntokumaru were played by Kataoka Nizaemon XIII and Nakamura Shikan VII. December 1979: Baikô played at the National Theatre the role of Ofude in the classic "Hirakana Seisuiki". January 1980: Baikô played at the National Theatre the role of Yamanba in the drama "Modoribashi Senani Gohiiki". March 1980: Baikô played at the National Theatre the role of the shirabyôshi Hanako in the dance "Kyôganoko Musume Dôjôji". October 1980: Baikô played at the Misonoza (Nagoya) the role of the shirabyôshi Hanako in the dance "Kyôganoko Musume Dôjôji"; the role of the demon-queller was played by Bandô Hikosaburô VIII. February 1982: Baikô played at the Kabukiza the roles of Kojirô and Atsumori in the "Jinmon" and "Kumiuchi" scenes of the classic "Ichi-no-Tani Futaba Gunki"; the roles of the warrior Kumagai Jirô Naozane and Princess Tamaori were played by Ichimura Uzaemon XVII and Onoe Kikugorô VII. May 1984: Baikô played at the Kabukiza the roles of Kojirô and Atsumori in the "Jinmon" and "Kumiuchi" scenes of the classic "Ichi-no-Tani Futaba Gunki"; the roles of the warrior Kumagai Jirô Naozane and Princess Tamaori were played by Onoe Shôroku II and Nakamura Jakuemon IV. March 1985: Baikô played at the National Theatre the role of Tamate Gozen in the drama "Sesshû Gappô-ga-Tsuji"; the roles of Gappô and Shuntokumaru were played by Ichimura Uzaemon XVII and Nakamura Tokizô V.
May 1992: Baikô played for the last time the role of the Wisteria Maiden in the dance "Fuji Musume", which was staged at the Kabukiza. October 1994: Baikô played at the National Theatre the role of Tamate Gozen in the drama "Sesshû Gappô-ga-Tsuji"; the roles of Gappô and Shuntokumaru were played by Ichimura Uzaemon XVII and Sawamura Tanosuke VI. February 1995: Baikô was expected to play at the Kabukiza the role of En'ya Hangan in the 1st, 3rd and 4th acts of the classic "Kanadehon Chûshingura". He fell ill and was replaced from the 1st day to the last day by his son Onoe Kikugorô VII. 24 March 1995: Baikô died. Onoe Baikô VII was one of the leading onnagata and nimaime of the second half of the twentieth century. Onoe Baikô VII's best roles: the Wisteria Maiden ("Fuji Musume"), Tamate Gozen ("Sesshû Gappô-ga-Tsuji"), Omitsu ("Nozaki-mura"), Yoshitsune ("Kanjinchô"), En'ya Hangan ("Kanadehon Chûshingura"), Omiwa ("Imoseyama Onna Teikin"), Shizuka Gozen ("Yoshitsune Senbon Zakura"), Soga Jûrô ("Kotobuki Soga no Taimen"), Yasuna ("Yasuna").